Skin Yeast Infections Can Affect You Systemically - YeastInfection.Org by Eric Bakker N.D. The common types of skin yeast infections can often affect other parts of the body as well, especially if the condition is allowed to remain for some time going into a chronic phase. For example, you may have a severe case of athlete’s feet and develop bloating, gas, burping, diarrhea or even break out in a rash on the palm of your hand. Now you have two problems, both connected but seen by doctors as separate conditions requiring different drugs. The fungus did this by becoming systemic and releasing mycotoxins into the blood stream, and the mycotoxins then affected your gastrointestinal system or the skin on the palm of your hand. I call yeast a micro-beast for this reason, it travels through it’s unsuspecting host and can affect you systemically in many different ways. Take a look at the common and not so common signs and symptoms of yeast infection. Skin yeast infections have even been linked with elevated blood cholesterol levels. When for instance toenail fungus was treated, cholesterol levels were reduced. This of course would mean that, without a doubt, the fungus contributed to high cholesterol. A leading research (Constantine in 1994) discovered that cholesterol can actually bind to the fungal mycotoxins in your blood due to your immune system’s response to the yeast poisons. Aspergillus is a single celled yeast organism which can seriously affect a person’s health. People with infections of the lungs have often been found to suffer from skin yeast infections. Some may even resemble skin cancer. 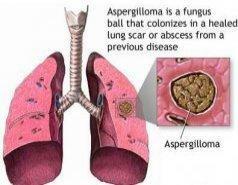 (Kibbler) Aspergillosis is a group of diseases caused by the yeast Aspergillus. The symptoms are fever, a cough, chest pain or breathlessness occur in many other illnesses so diagnosis can be hard. Usually it is only in patients with already weakened immune systems or who suffer other lung conditions are susceptible. Some Aspergillus species however can cause serious disease in humans and animals. Allergic aspergillosis (which affects those asthma, cystic fibrosis and sinusitis patients). Acute invasive aspergillosis (risk increases if patient has weakened immunity such as some cancer patients and those on chemotherapy). What I have commonly found is that the common skin diseases like psoriasis, acne, hives, and eczema at first glance don’t seem to have any relation to an internal candida fungus infection. But, when people who have these other common skin complaints are treated for a fungal infection, their external skin problems may well go away. There are various studies showing that psoriasis is indeed a fungal infection or linked to a fungal origin caused by either the fungus itself or their mycotoxins being released into the blood stream. (notini 1994) Psoriasis is supposedly an incurable disease, I have not found this to be the case. There are no “incurable” diseases, but plenty of patients who are resistant to correct treatment measures, in addition to many health care professionals who have one-tracked minds when it comes to skin treatments – local and external only. People with chronic skin complaints all too easily give up, and are in a constant search of “that magic cream” or potion that will banish all the itching, redness and discomfort. Patients often find it amazing that the last thing I am concerned about is their skin problem, I want to get their digestion right FIRST – and then look at local treatment. It is important naturally to offer some comfort if the skin is itchy, flaky, red and irritable – but it is not the over riding factor. The internal problem, is in most cases, preventable. Usually, it is caused by diet, antibiotics, steroids, birth control pills, or possible inhaling of fungal spores in the home through air conditioning systems. Have you ever seen a child with eczema that has not been exposed to antibiotics at one time or another? Remember that skin yeast infections are usually a sign that something is wrong inside your body. With that in mind these signs and symptoms should not be taken lightly. If you suffer from any skin yeast diseases it may be wise to take a look at your lifestyle and diet much more closely, what you did (and ate or drugs like antibiotics you took) before the disease showed symptoms. Buck, D. S., et al. Comparison of two topical preparations for the treatment of onychomycosis: Melaleuca alterniflora (tea tree) oil and clotrimazole. The Journal of Family Practice. 38(6):601-605, 1994. Ponikau, J. U., et al. The diagnosis and incidence of allergic fungal sinusitis. Mayo Clinic Proceedings. 74:877-884, 1999.